On 8 May 1726, excavators discovered a marble bas relief in Monte Testaccio near Rome’s Porta di S. Paolo in Rome. Damaged and partial, it portrayed the philosopher Diogenes in a repaired pithos. In the background was a temple, and on top of the pithos was a dog—a symbolic allusion to the Cynic philosopher. 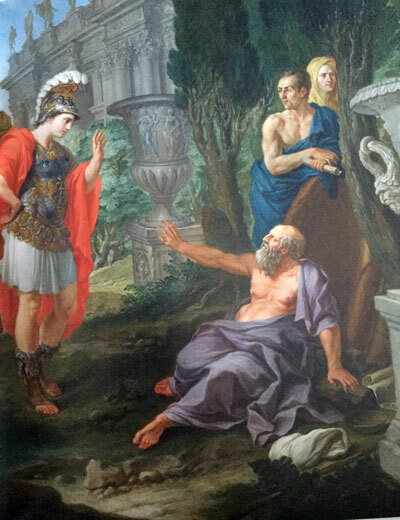 The scene was a fragment of a larger image representing the fictional meeting of Diogenes and Alexander, so often discussed in classical literature and portrayed in early modern painting and sculpture. The artist Pier Leone Ghezzi claimed that he purchased the relief while drinking in the Testaccio (famed for its wine cellars), paying one scudo for it. [i] Soon after its discovery, it entered the collection of the antiquarian-dealer Philipp von Stosch, who had it restored to the state in which it exists to the present day. In addition to some minor repairs, Stosch added the figure of Alexander as well as the head of Diogenes (derived from a statue in the Villa Albani). The conditions of the discovery, restoration, and subsequent reproduction of the Diogenes relief provides insights into the nature of antiquarianism in the early eighteenth-century Italy. Since collections needed to serve as symbols of their owner’s wealth, power, knowledge, and/or taste, the material culture of the everyday—common tools and the detritus of daily life—were marginal. Throwaway items, such as undecorated pottery or the assemblages found in middens, were virtually ignored. This was a world that prioritized antique objects that could speak to aesthetic interests, mythological narratives, morality, the histories of great lives, and the administration of the state. The types of ancient objects that most elites and scholars collected and reproduced in drawings and prints tended to be sculptures, gems, and intaglios—especially those that could illustrate accounts from ancient literary texts. Likewise, they might collect finely wrought decorative or religious object that could verify or supplement ancient descriptions of sacred and profane practices. The opus magnum of Bernard de Montfaucon—L'antiquité expliquée et représentée en figures (1719-24)—is illustrative of these tendencies. Published in ten volumes with five supplements, it integrated objects from collections throughout Europe. It had four major sections. The first, concerned itself with the gods, temple architecture, and religious practices of the ancient Greeks and Romans as well as a number other related groups including the Egyptians, Persians, Scythians, Germans, Gauls, and Carthaginians. The second section focused on the practices of everyday life, including civic rituals. It examined clothing, furniture, marriages, games, festivals, and more. The third section discussed the practices of war, the nature of civic architecture (roads, bridges, aqueducts), as well as navigation and the construction ships. The final portion of the work emphasized the afterlife by describing ancient funerary practices as well as beliefs about the underworld. Nearly every object in Montfaucon’s volumes was of aesthetic, mythological, moral, or historical interest to contemporaries. Stosch’s bas relief would have fit in perfectly in that it spoke to both a moral and historical narrative. While limiting their interests to a narrow range of ancient material culture, early eighteenth-century collectors and scholars were keen to restore their damaged antiquities to a pristine state. Stosch’s bas relief had survived since antiquity, but it was incomplete and had sustained significant damage. Thus, he sought out a conservator, perhaps from the workshop of Carlo Antonio Napolioni who was the preferred restorer of Cardinal Alessandro Albani, Stosch’s patron and fellow scholar. Napolioni was the first among many Roman experts who could salvage fragments and combine them into meaningful wholes—whether or not they reflected the original subject of the work. [v] Other restorers included the French artist Pierre Étienne Monnot, infamous in the late eighteenth century for transforming a Discobolus into a Wounded Gladiator. The practice of reconstruction reflected shifting attitudes towards antiquity and scholarship during the eighteenth century. In the early decades, a radical intervention, à la Monnot, was not uncommon. By the end of the century artists and scholars alike emphasized the beauties of the unreconstructed object. Stosch and his circle, which was active between the 1710s and 1750s, saw no problem in significantly restoring works, even if the retrofitted objects were quite imaginative by modern standards. The key was to attempt accurate reconstructions of the past. This did not mean a meticulous reproduction of the original object. Rather, “accuracy,” as it was understood in the practice of restoration during the early eighteenth century, meant veracity to the spirit of the object and its creators. [vi] In this sense, antiquity was something with which the moderns could creatively engage and reshape. Even as they looked to the past, they saw the object evolving with needs of modern society. Given that any item in a collection existed within a larger cultural field in which connoisseurs and collectors vied for influence and prestige, it is necessary to see objects in dialogue with contemporary interests. Likewise, it is important to understand that objects participated in a network of objects, cultural dispositions, and social practices. They were part of larger assemblages—of paintings, books, prints, drawings, coins, medals and more, which included both ancient and contemporary creations. Eighteenth-century collectors had an interest in circulating images of objects in their collections. This was how they developed a reputation for knowledge and taste. Thus, they wanted artists and connoisseurs to visit their cabinets. They encouraged the reproduction of their collections through prints and drawings. They might even commission works of art which highlighted their erudition and taste. As a dealer whose finances depended on his ability to convince others of his intellectual and aesthetic superiority, Stosch used the Diogenes relief to bolster his reputation. In quick succession, he commissioned two works which celebrated the new addition to his collection. The first was a medal, designed by François Marteau. On the obverse was a classicized head of Stosch, and on the reverse was a representation of Stosch’s bas relief. The figure of Alexander and a few other additions and alterations suggest that the image stamping of the medal was completed before the reconstruction of the bas relief. Nevertheless, they still follow the general layout of Salvator Rosa. [i] Pier Leone Ghezzi. Drawing of Diogenes Bas Relief. 1726. Codex Ottobonianus Latinus 3109. Vatican Library. “Fragmento di marmot antico che si ritrova in casa del Signor Baron Stosch, il quale rappresenta Diogene dentro la tina con il cane simbolo dei filosofi cinici, vicino alla muraglia di Atene [sic.]. Era alto palmi due e oncie 8 e largo palmi due e 3 oncie e lo ritrovò a Testaccio il di 8 maggio 1726 quando andava a bere e lo pagò scudo uno.” See Pier Leone Ghezzi, Marmi Antichi Nei Disegni Di Pier Leone Ghezzi, ed. Lucia Guerrini (Vatican City: Biblioteca Apostolica Vaticana, 1971), 76, tav. XIX. [ii] Plutarch, Life of Alexander 1.14. [iii] José María Blázquez and José Remesal, eds., Estudios sobre el Monte Testaccio, vol. 3 (Barcelona: Publicacions de la Universitat de Barcelona, 2003); José María Blázquez and José Remesal, eds., Estudios sobre el Monte Testaccio, vol. 2 (Barcelona: Publicacions de la Universitat de Barcelona, 2001); José María Blázquez Martínez and José Remesal Rodríguez, eds., Estudios sobre el Monte Testaccio, vol. 1 (Barcelona: Publicacions de la Universitat de Barcelona, 1999); José María Blázquez Martínez and José Remesal Rodríguez, eds., Estudios sobre el Monte Testaccio, vol. 4 (Barcelona: Publicacions de la Universitat de Barcelona, 2007); José María Blázquez Martínez and José Remesal Rodríguez, eds., Estudios sobre el Monte Testaccio, vol. 5 (Barcelona: Publicacions de la Universitat de Barcelona, 2010). [v] Cristiano Giometti, “‘Per Accompagnare L’antico’ the Restoration of Ancient Sculpture in Early Eighteenth-Century Rome,” Journal of the History of Collections 24, no. 2 (July 1, 2012): 219–30, doi:10.1093/jhc/fhp046; Seymour Howard, “Restoration and the Antique Model: Reciprocities between Figure and Field,” in History of Restoration of Ancient Stone Sculptures: Papers Delivered at a Symposium Organized by the Departments of Antiquities and Antiquities Conservation of the J. Paul Getty Museum and Held at the Museum, 25–27 October, 2001, ed. Janet Burnett Grossman, Jerry Podany, and Marion True (Los Angeles: Getty Publications, 2003), 25–44; Mark Jones, ed., “The Restoration of Classical Sculpture in the Eighteenth Century and the Problem of Authenticity,” in Why Fakes Matter: Essays on Problems of Authenticity (London: British Museum Press, 1992), 41–50; Jessica Hughes, “The Myth of Return: Restoration as Reception in Eighteenth-Century Rome,” Classical Receptions Journal 3, no. 1 (May 1, 2011): 1–28, doi:10.1093/crj/clq017; Seymour Howard, Antiquity Restored: Essays on the After Life of the Antique (Vienna: Irsa Verlag GmbH, 1990); O. Rossi Pinelli, “Chirurgia Della Memoria: Scultura Antica E Restauri Storici,” in Memoria Nell’antico Nell’arte Italiana, ed. Salvatore Settis, vol. 3 (Turin, 1986), 181–250. [vi] This creative appropriation of the past was fundamentally different from Eugène Emmanuel Viollet-le-Duc’s approach a century later, which has been negatively termed “repristination”—an attempt to return an object to a pristine, historically-correct, like-new state that may never have existed in the past. See Eugène-Emmanuel Viollet-le-Duc and Henri Sabine, “Restauration,” in Dictionnaire raisonné de l’architecture française du XIe au XVIe siècle (Paris: Ve A. Morel, 1875), 14–34. [vii] David Ormrod, “The Origins of the London Art Market, 1660-1730,” in Art Markets in Europe, 1400-1800, ed. Michael North and David Ormrod (Aldershot: Ashgate, 1998), 167–86; Brian William Cowan, “Art and Connoisseurship in the Auction Market of Later Seventeenth-Century London,” in Mapping Markets for Paintings in Europe 1450-1750, ed. Hans J. van Miegroet and Neil De Marchi (Turnhout, Belgium: Brepols, 2006), 263–84; John Brewer, The Pleasures of the Imagination: English Culture in the Eighteenth Century (London: Routledge, 2013), 168–70. [viii] Julia Kagan, “Philipp von Stosch in Porträts Auf Geschnittenen Steinen Aus Den Sammlungen Der Leningrader Ermitage Und Der Berliner Museen Und Einige Fragen Der Ikonographie,” Forschungen Und Berichte, 1985, 9–T2; Malcolm Baker, Colin Harrison, and Alastair Laing, “Bouchardon’s British Sitters: Sculptural Portraiture in Rome and the Classicising Bust around 1730,” The Burlington Magazine 142, no. 1173 (December 2000): 752–62; Gabriella Tassinari, “Lettere Dell’incisore Di Pietre Dure Francesco Maria Gaetano Ghinghi (1689-1762) Ad Anton Francesco Gori,” LANX 7 (2010): 61–149. As a spy, a sometimes dubious dealer, and even a thief at times, Stosch relied on the support of Cardinal Albani to elevate his reputation. Albani’s purchase of Stosch’s collection as well as his commission of Johann Joachim Winckelmann’s to catalog it was central to preserving his intellectual legacy. Eventually, Winckelmann even reproduced the Diogenes and Alexander bas relief in his Monumenti Antichiti. See Johann Joachim Winckelmann, Description Des Pierres Gravées Du Feu Baron de Stosch (Rome: André Bonducci, 1760); Johann Joachim Winckelmann, ed., Monumenti Antichi Inediti (Rome, 1767), http://catalog.hathitrust.org/Record/100235788.